I love limes. I never have a Rum and Coke® without either a slice of lime (preferred) or a squeeze of ReaLime® lime juice from the fridge. 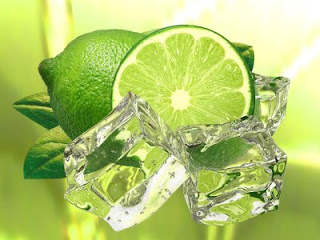 I like to rub the lime slice around the lip of the glass to give the drink the extra boost of lime flavor that I get from smelling the juice as I drink… heavenly. Limes are essential to countless cocktails either as ingredients or as a decorative garnish; witness the innumerable cocktail photos featuring juicy looking lime wheels. They also make cocktails healthy sources of Vitamin C and anti-oxidants. I always keep some limes on hand (especially if I plan on making Margaritas) and stock up when we’re entertaining. Always use a sharp knife when cutting limes – even for juicing; dull knives just aren’t safe and can result in messy looking cuts. I always have a small cutting board and a ceramic knife at the bar for slicing limes (or lemons). When making lime wheels or wedges for cocktails, avoid limes with brown or yellow spots – they ruin the look of your drink. Wheels must be thick enough to stand up straight and hold their position on the glass, around 1/8 inch. Cut along one of the segment lines from the center toward the least attractive side of the lime, if there is one. If you’re short on limes, you can always do half-wheels. Use the lime ends for rubbing around the glass rim when salting or sugaring a glass. Fresh lime juice is best for any cocktail, but especially for Margaritas. You get 1 to 1 ½ oz. per lime, just enough for a Margarita. I bought a Norpro Stainless-Steel Citrus Juice Press a few years ago and love it. A plastic or aluminum juice press is like a faithless lover; they will desert you and leave you crying in the middle of a cocktail party (when the handle breaks). Stick with stainless steel. One thing is counter-intuitive about this type of press: the cut face of the lime goes toward the holes. Squeeze hard and enjoy! Look for limes that are green and plump. If one lime of two that are the same size feels heavier, choose it – it’s juicier. Avoid limes with brown spots if possible; if you must, the less brown the better. Yellow patches indicate that the lime is beginning to ripen; if a lime gets too yellow, the flavor will ultimately be affected, but a finger-sized yellow section is no big deal. Wash limes and lemons thoroughly when you get them home to remove all trace of pesticides. I like to stock up on limes when they’re on sale, but the problem is keeping them fresh until you use them. Limes will last for about a week if you store them on the kitchen counter, then the skin hardens or they get brown spots. A method I found on the web years ago is to wash them and put them (wet) into a zip-lock baggie and store them in the vegetable crisper. I used this technique for years to add an extra week to lime freshness until I discovered Debbie Meyer Green Bags . Store limes (dry) in a Green Bag in the crisper and they last a lot longer. I have returned from a week-long trip, remembered that I had an old bag of limes in the fridge, and discovered that they were still good when I thought I would have to throw them out. Amazon reviewers either swear by or swear at Green Bags, but I love them for limes. No matter what storage technique you use, segregate any limes that are going over the hill from the healthier limes and discard them or use them first.